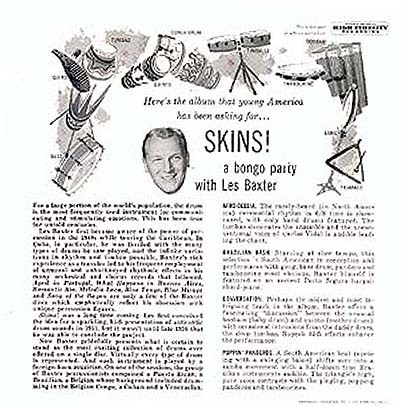 Notes: Ever the party animal, when America's taste for the exotic turned to percussion Les Baxter and friends were right there to fill the void. This is a 3 EP set (45 RPM) produced in the 50's. Each record has three or four tracks played entirely on percussion instruments and the liner notes state that, "Virtually every type of drum is represented...each instrument is played by a foreign-born musician". The material ranges from solo bongo to some tasty jazz influenced pieces on a full drum set. One look at the cover photo and you know that some hedonistic revelry is gonna break out at any moment. 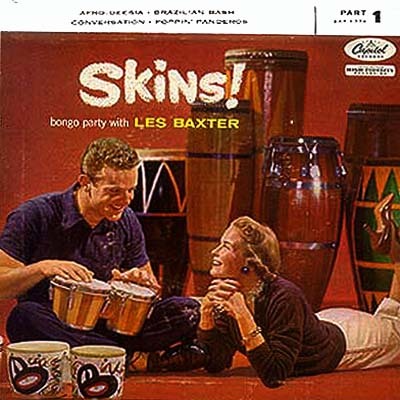 So whether you're a drummer, percussionist or just a hep cat or kitten looking for a little party music this is your record. And besides, even Barney Fife plays the bongos.